Cinderella, Nanny McPhee & 2 Corinthians 5:17. When you make the decision to follow Jesus and you have the Holy Spirit in you, you are made new. Yay! isn’t that so great to hear? But hold on, that doesn’t mean you are Cinderella and Jesus is the Fairy “God” mother. Oh, No. It’s more like Nanny McPhee, with each lesson you learn by studying the word of God, you equip yourself and are able to move on from who you were before. For some people, the change is instant like Apostle Paul but for others, the change may not happen all at once, rather it starts from the inside. The Holy Spirit works within us to change the way we see things and change our behavior. This is why it is important to keep on studying the word of God, when we study the word we feed our spirit and by doing this we renew our minds and become new and purified more and more each day. Look at that verse carefully, it says “He Is” not “He will be” that means you are already a new creation, it’s beholding and actually seeing that all things have become “new” that takes faith and hard work! 2 Corinthians 5:17 is also a verse of encouragement, once you have Jesus, your past no longer defines you because He has taken it away. He takes away all our shame and regrets so we can focus on eternity that lies ahead of us. 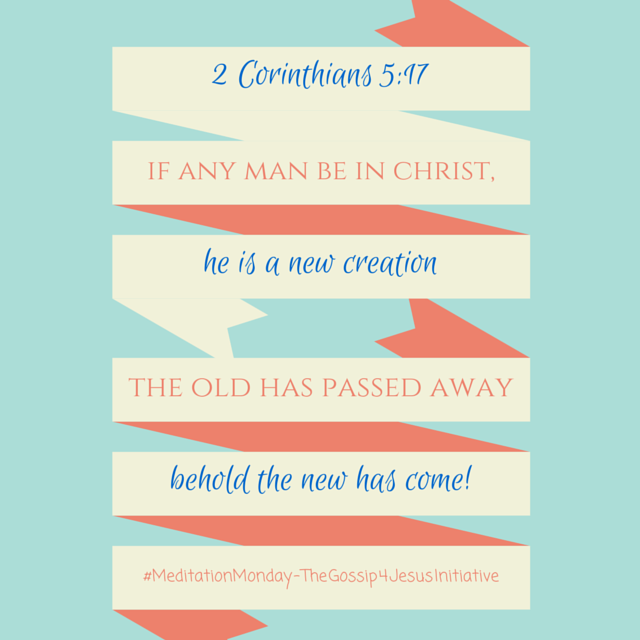 I am no longer that person because Christ has taken the old away. I am no longer going to be that person, I am no longer going to do those things or think about those sinful things that I did. I am sorry for doing those things and I repent from them but I will no longer dwell on them, I will no longer dwell on my past. I choose to move on in Jesus name! Then put those thoughts behind you! not some things, but All things. If you accept Jesus, you come to Him knowing that every aspect of your life is open to change and is going to be made new. Sometimes this is scary because many of us find it hard to let go of certain aspects of our life, we just don’t like change or we are scared of change and what people will think. What if Cinderella had refused to let the fairy god mother change her because she was afraid of what her stepmother/stepsisters would say? We wouldn’t have such a great love story today! You can bet the love story Christ has for you is far greater than Cinderella so you better let go and let God have His way. For God to work in us, we need to be in Christ, and to be in Christ, we need to put some things in the past. If we look at this verse, we take comfort in knowing that we really don’t have to do it on our own — we just have to submit and let Him work in us. If we aren’t in Christ, we can’t become a new creation, we can’t be made new. Cinderella was desperate to go to the ball, how desperate are you to be made new? How desperate are you for your new self to begin to manifest? Behold the new!, Stop focusing on things that are already gone, stop fighting battles that CHRIST has already won!